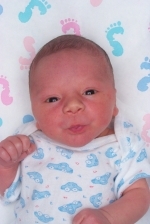 Jennifer and Darren have chosen the name Jordan Banks for their beautiful new son born August 14, 2001 at Sacred Heart Medical Center. Baby's doctor: Robert L. Velarde, M.D. The top grossing movie was: "American Pie 2"
1863 - Ernest Thayer - American writer who penned baseball's most famous poem, "Casey at the Bat." 1945 - Steve Martin - Comedian and actor who starred in a long list of Hollywood films, including "The Jerk", "The Man With Two Brains", "Parenthood" and many more. 1950 - Gary Larson - Cartoonist whose imagination spawned the classic cartoon series "The Far Side." 1959 - Earvin "Magic" Johnson - Incredible and dominant guard for the Los Angeles Lakers who was selected NBA Most Valuable Player three separate times. 1635 - A storm ravaged the pilgrim's settlement at Plymouth in what was probably the European's first exposure to a hurricane on the North American continent. 1945 - President Harry Truman announced to the world that Japan had surrendered to the Allies ending World War II. Hey Jordan! Welcome to the world . . .